Brush Design can be as easy as replacing an existing brush with another brush, or it can be a complex matter that requires a number of different ideas to be evaluated before a completed brush is ready. 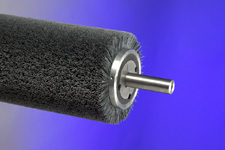 Industrial Brush offers 3 different types of brush constructions. 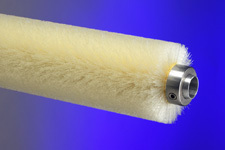 For most applications, our "Tufted" and "Fineset" brushes meet the challenges for typical manufacturing. "Fineset " brushes afford uniform cleaning and the ability to control gentle and aggressive applications uniformly across the brush surface. "Tufted" units lend themselves to infinite designs and patterns. 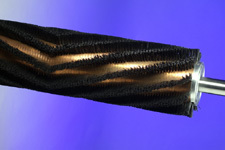 When the application involves aggressive wire bristle, a strip brush that is helically wound provides the most aggressive and sure job. There are thousands of known brush applications all of which can be reduced to six actual brush functions. The Chart below tends to over-simplify the three basic ingredients (Winding, Bristle Arrangement, and Density) to manufacture an effective brush unit. It should, however, be used as a point of reference when relating brush function to our staff. Possible core constructions can be very simple, requiring only a simple selection of sizes and shaft dimensions. However, it can also be more complex, requiring special bushings or balancing. Below, you will see a number of different core configurations ranging from simple to complex. Your present brush may be identified below, or you may see an idea that strikes you as special to your application. Please feel free to use the description as a way of expressing your needs to our staff. We also encourage you to print the drawing that best illustrates your requirements and include it in a Fax to our sales staff for further assistance. A complete brush and core assembly manufactured with shafts to fit a customer's specific machine requirements. The shafting can be turned to accept any number of different diameters that may be associated with bearings, drives, locking nuts, etc. This unit is ready for insertion and use upon delivery and is available in all the brush designs offered. Because of the manner in which it is manufactured, it is the design of choice for those applications where TIR and balance are critical. Most integral cores are reusable and can be returned for re-bristling. This design incorporates no special hardware, and can be made as a simple shaft with nothing more than a key to drive the brush. The shaft ends can also be machined to incorporate various bearing, pully or sprocket sizes. 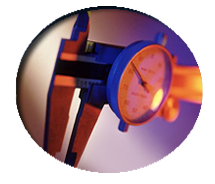 The shaft diameter determines the base core size and the filament projects the entire distance from shaft to brush OD. A brush and core assembly manufactured with in-line arbor bore holes to fit customer's thru shaft. The brush and core unit are mounted and secured on a keyed shaft. This design is available as a light duty brush with aluminum heads, or it can be upgraded to a very substantial brush unit by replacing the aluminum heads with a tapered locking collar. The aluminum head design is typical for many disposable thru shaft brushes. However, when the application becomes more aggressive and high speeds are important issues, the taper lock designs provide outstanding holding power to the thru shaft and provide better concentricity and balance. The arbor is a permanent shaft that is manufactured to fit a customer's specific machinery requirements. The brush is a separate part that fits the permanent arbor. The brush sleeve is designed to be either re-bristled or thrown away. Simple assemblies include flanges to fit the brush sleeve, and are generally driven with an internal key, drive pins, or sometimes a compression nut on one side. Heavier applications that require large rigid shafting, and close operational tolerances, are made with a more substantial sleeve. 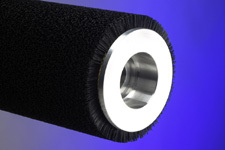 These brushes are designed using internal sleeve compression fittings, called taper lock bushings, that lock to the permanent shaft in a more substantial way. 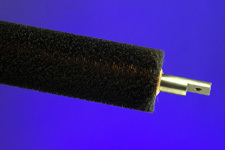 A disposable brush and core sleeve supplied with adaptor bushings to fit a customer's specific shaft size. Adaptor bushings may be reused if desired. this type of brush is generally compression driven. 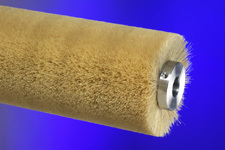 A special brush and core assembly designed to accept internal bearings to fit a customer's specific shaft requirements. The design can include a Vee-belt hub for drive, or the hubs are used as housings for the internal bearings when the customer needs to use the brush as a backup roller for perfing, slitting, or transferring. 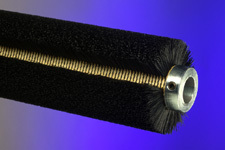 A disposable brush and core assembly that slides directly on a customer's shaft, utilizing locking collars with set screws. 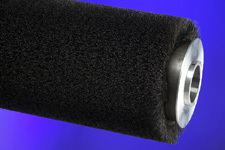 These disposable sleeves are throw-away modules, designed for shaft diameters up to 1-3/4". 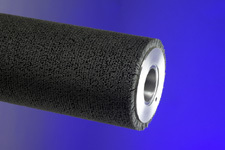 A disposable brush and core assembly that slides directly on a customers shaft utilizing compression drive. These disposable sleeves are throw-away modules, designed for shaft diameters up to 1-3/4" diameter.